This bundle integrates HTTPlug with the Symfony framework. The bundle helps to register services for all your clients and makes sure all the configuration is in one place. The bundle also features a profiling plugin with information about your requests. This guide explains how to configure HTTPlug in the Symfony framework. See the HTTPlug Tutorial for examples how to use HTTPlug in general. HttplugBundle is officially supported by Symfony Flex and available as the httplug alias. Install the HTTPlug bundle with composer and enable it in your AppKernel.php. If you already added the HTTPlug client requirement to your project, then you only need to add php-http/httplug-bundle. Otherwise, you also need to specify an HTTP client to use - see Clients & Adapters for a list of available clients. You can find all available configuration at the full configuration page. The first configured client is considered the “default” client. It is available for autowiring both for HttpClient and HttpAsyncClient. This can be convenient to build your application. When using a client configured with HttplugBundle, you will get debug information in the web debug toolbar. It will tell you how many request were made and how many of those that were successful or not. It will also show you detailed information about each request. The web profiler page will show you lots of information about the request and also how different plugins changes the message. See example screen shots below. The body of the HTTP messages is not captured by default because of performance reasons. Turn this on by changing the captured_body_length configuration. You can set captured_body_length to null to avoid body limitation size. The profiling is automatically turned off when kernel.debug = false. You can also disable the profiling by configuration. You can configure the bundle to show debug information for clients found with discovery. You may also force a specific client to be found when a third party library is using discovery. The configuration below makes sure the client with service id httplug.client.my_guzzle5 is returned when calling HttpClientDiscovery::find() . It does also make sure to show debug info for asynchronous clients. Ideally, you would always use dependency injection and never rely on auto discovery to find a client. For normal clients, the auto discovery debug info is enabled by default. For async clients, debug is not enabled by default to avoid errors when using the bundle with a client that can not do async. To get debug information for async clients, set discovery.async_client to 'auto' or an explicit client. You can turn off all interaction of the bundle with auto discovery by setting the value of discovery.client to false. You can configure your clients with default options. These default values will be specific to you client you are using. The clients are later registered as services. # These options are given to Guzzle without validation. New in version 1.10: If you already have a client service registered you can skip using the factory and use the service key instead. Clients can have plugins that act on the request before it is sent out and/or on the response before it is returned to the caller. Generic plugins from php-http/client-common (e.g. retry or redirect) can be configured globally. You can tell the client which of those plugins to use, as well as specify the service names of custom plugins that you want to use. Additionally you can configure any of the php-http/plugins specifically on a client. For some plugins this is the only place where they can be configured. The order in which you specify the plugins does matter. See full configuration for the full list of plugins you can configure. To configure HTTP caching, you need to require php-http/cache-plugin in your project. It is available as a separate composer package. You can configure a client with authentication. Valid authentication types are basic, bearer, service, wsse and query_param. See more examples at the full configuration. Using query parameters for authentication is not safe. The auth params will appear on the URL and we recommend to NOT log your request, especially on production side. If you want to use the FlexibleHttpClient or HttpMethodsClient from the php-http/client-common package, you may specify that on the client configuration. httplug.client. [name] There is one service per named client. that client, otherwise it is an alias to the first client configured. These are plugins that are enabled by default. * These services are always an alias to another service. You can specify your own service or leave the default, which is the same name with `.default` appended. 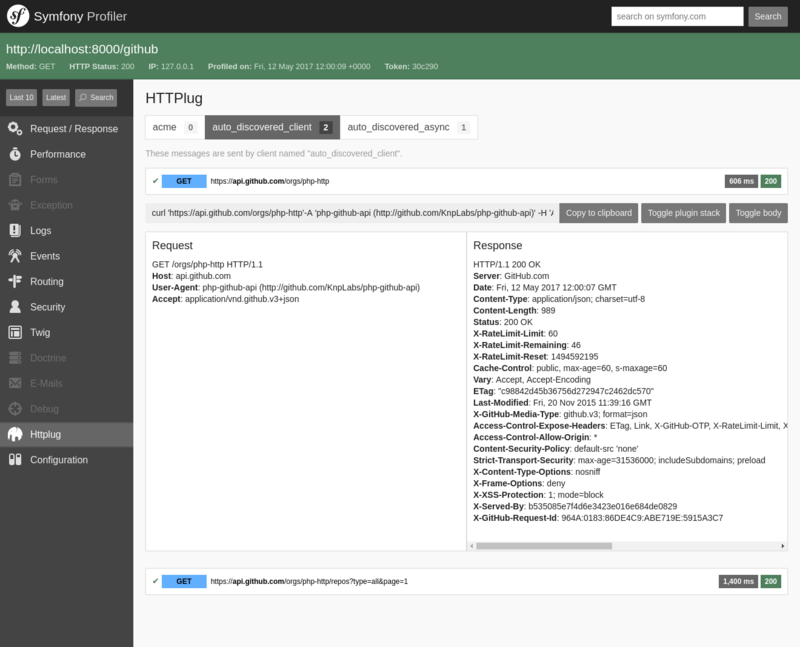 Rather than code against specific HTTP clients, you want to use the HTTPlug Client interface. To avoid building your own infrastructure to define services for the client, simply require: php-http/httplug-bundle in your bundles composer.json. You SHOULD provide a configuration option to specify which HTTP client service to use for each of your services. This option should default to httplug.client. This way, the default case needs no additional configuration for your users, but they have the option of using specific clients with each of your services. The only steps they need is require one of the adapter implementations in their projects composer.json and instantiating the HttplugBundle in their kernel. // If your test has the client (BrowserKit) make multiple requests, you need to disable reboot as the kernel is rebooted on each request.